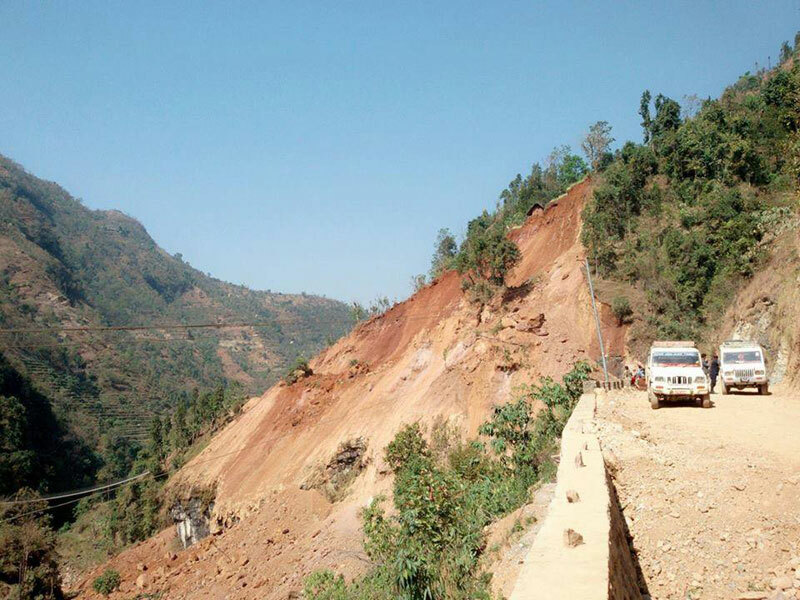 BAGLUNG, Mar 5: A section of the mid-hill highway in Manewa of Righa VDC in Baglung district was obstructed due to a landslide on Sunday morning. It has also blocked the Daram river and turned it into a lake. The landslide also brought down seven electricity poles of the central transmission grid. The early-morning disaster that struck at around 5:30 am caused the death of a woman, who was electrocuted when a pole fell upon her. The deceased has been identified as Mana Kumari Nepali. Although she was taken to a local hospital after the incident, unfortunately she succumbed to her injuries. According to Anil Kumar Khadka, spokesperson of District Police Office, Baglung, the road was obstructed when a mass of land fell down from 150 meter above, obstructing 200 meters of the highway. “The landslide has even created a 150-meter long lake, which is 15 meters deep by blocking the Daram khola,” said Khadka. He further informed that water has started overflowing from the lake, effectively minimizing the risks of outburst and inundation. According to Badri Sharma, chief division engineer at the mid-hill highway in Baglung, the 'dry landslide' was a result of the digging of land along the highway for laying pipes to produce energy by the Daramkhola Hydroelectricity Project Limited. “When they asked for permission, we had told them to lay pipes toward the cliff as the edge of the highway was quite steep, ” said Sharma. He informed that clearing the rocks and land will take some time. “I have already asked the construction companies and Hydropower project working in along the highway to fix the problem and they assured to make the highway ready in about five-six days,” said Sharma. Chief District Officer of Baglung, Bhagirath Pandey, has instructed a team of police and army for observation and also to clean the landslide. “We have already sent Nepal Police and Nepal Army personnel from Ghodabadhe and now we will be taking steps as per their reporting,” said CDO Pandey. He also added that the district administration office has instructed other concerned authorities to resume transportation as soon as possible.